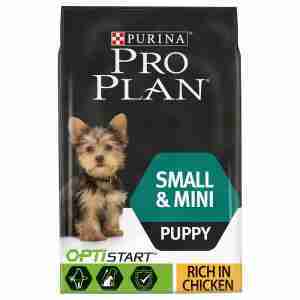 Tasty and healthy, the Purina Pro Plan dog small and mini puppy with OPTISTART rich in chicken dry food keeps your puppy's tummy full and helps them get all the nutrients and vitamins they need for a healthy start in life. Combining nutrients, mineral and vitamins, this yummy recipe keeps your puppy healthy with a balanced diet that strengthens their immune system. This is important for your little pup's overall health as it helps them fight off nasty illnesses and infections as they grow up. The dry dog food is high in colostrum which is found in their mother's milk and is a great way to boost their immune system. Packed with vitamins A, C, D & E, the biscuits look after your puppy's joints, skin and coat; they also have a high fibre content which keeps your pooch's digestive system running smoothly. extra colostrum to help boost their immune system. Feeding your four-legged friend a healthy, balanced diet helps you get them on the right path as they begin their journey to adulthood. The hearty mix of vitamins, nutrients and minerals in this Purina dry food in chicken flavour not only tastes yummy but also helps boost your new furry friend's natural defences. Your little furry pal needs a different diet to adult dogs which includes lots of extra nutrients and minerals to help strengthen their immune system and toughen them up so they can fight off any illnesses that may come their way. Always make sure you have a chat with your vet before you change what your pet eats. Tiny dog biscuits is brilliant 4 the chihuahuas & minitures toy dogs..